The release of Unibroue 17 is one of the only things I like about Christmas time in Manitoba, ever since 2013 the newest annual batch of U17 was expected to make its way to Manitoba. Unfortunately for this year, it's not going to. Well.. Unibroue 17 2013-15 vertical pack is here, but just not the 2017 edition. 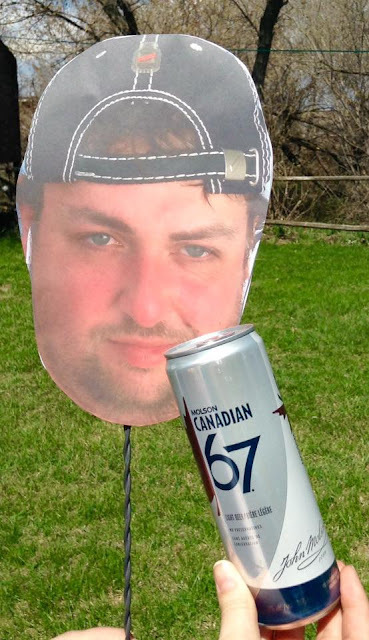 I heard a few months ago that they were coming out with a 25th anniversary ale, something a bit different than usual. Since I'm still probably the biggest Unibroue fan, I needed to try it. It turns out for their 25th anniversary, they came out with this beer - 25e Anniversaire, and 25th Blonde d'enfer. The Blonde d'enfer I doubt I'll ever see to be honest. 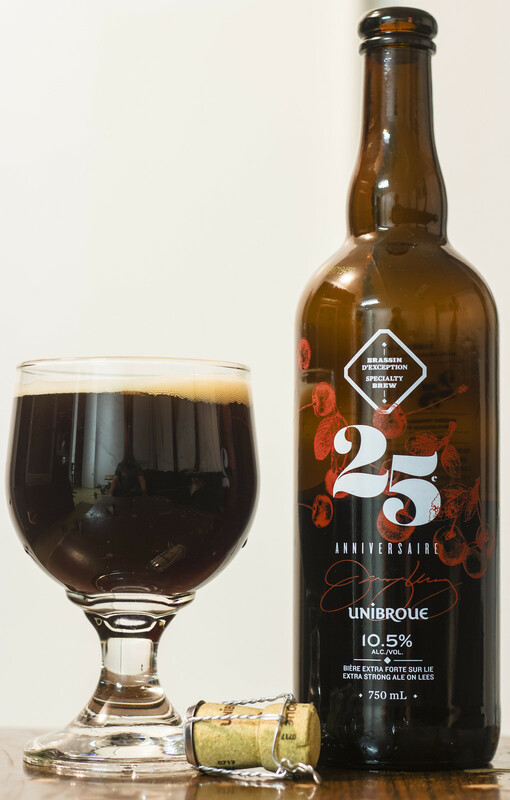 Unibroue's 25e Anniversaire ale is described as having roasted malt aromas, dark chocolate flavours and delicate fruity accents that lead to a slightly tart finish. It's also described as a Black Forest cake in a bottle. 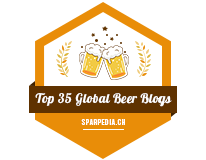 Appearance: 25e pours an almost blackish dark brown ale with a heavy dark hue to it. Good amount of carbonation as it comes out of the bottle but not any gushing thankfully. Good amount of yellow/beige head on top that doesn't want to go anywhere - quite frothy. Aroma: This is one of the more complex Unibroue beers I've had in the last little bit. This one starts out with a sour cherry tartness that reminds me a bit of a kriek. There's notes of dark chocolate, a light amount of woodiness, light amount of roasted malt, and also a hint of Black Forest cake.. even though I've already pointed out the cherries/dark chocolate.. but it's kind of cakey too. Taste: The sour cherry flavour is the most dominant flavour in the brew, it's mildly sour yet decently sweet. There's notes of the typical Unibroue yeast, flavours that remind me a lot of Trois Pistoles, dark chocolate, a light amount of roasted malt, a heavy dose of Black Forest cake popping up in every few sips. This is sweeter than most of Unibroue's typical offerings, and I wish that the tartness of the cherries here would've been used in their Éphémère Cerise years back rather than a plain sweet cherries they used. There's a moderate amount of boozy burn popping up here and there, but for the most part.. the other flavours mask it to an extent. Overall Thoughts: I initially tried this beer yesterday and found in my tastings then that the Black Forest cake was much more prominent than today's bottle, it was much chocolatier and even sweeter.. maybe it was my palate after trying a few beers? Interesting beer from Unibroue, while not quite as wowing as Unibroue 17, but this is definitely a dessert friendly beer that has notes that are reminiscent of Trois Pistoles with a chocolate and cherry presence to it.